Who says golf isn’t exercise? Did you know that the average golfer walking an 18-hole golf course covers approximately 4.5 miles and burns more than 500 calories? Now add the physical exertion of striking the golf ball 100-200 yards time and time again. Not bad for a game known more for its social graces than cardiovascular benefits. Golfers know that this game is more than a casual walk in the park. In fact, statistics show it can be downright dangerous. 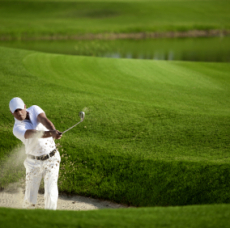 Sports physiologists report that injuries to the neck, back and shoulder areas are prevalent among golf aficionados. With an estimated 24 million Americans hitting the links last year, that’s a world of hurt. “Golf is one of the few sports which attracts a lot of non-athletes and aging weekend warriors. The result is a lot of golfers end up hurting their back, pulling a muscle, or winding up with a stiff neck,” says John Carrido, fitness instructor and former Mr. California body building champion. Shortly after Carrido took up with a local pro, he was surprised at how many serious golfers routinely underestimated the mental and physical exertion required to play consistently good golf. “We would hit the 11th hole and their game would start to go downhill. They had no idea that they were battling mental and physical fatigue,” says Carrido. This is an avoidable syndrome that often translates into extra strokes, frustration and inconsistent play. He says he has noticed that a growing number of more athletic, fitness-oriented golfers are beginning to change the image of golf. “Now you find more and more pros skipping the proverbial 19th hole and heading to the gym to quench their thirst. With so much prize money at stake, they certainly can’t afford to risk injury, much less a sore back,” Carrido says. He believes the same can be said for social golfers. “People used to think of golf as a no-sweat game – a walk in the grass, a beer with some friends, a friendly wager. But today, more and more golfers are getting serious about improving their game and are approaching it as a discipline. Now, the best golfers are hitting the gym with a passion, right alongside other athletes. Though he’s only 5 feet 4 inches tall, Carrido can consistently drive the ball more than 290 yards. “Many players don’t realize that the momentum of the golf swing is extremely demanding on the neck, back and shoulder areas. If they ignore these muscle groups, they are more likely to sustain an injury,” Carrido warns. He suggests simple stretching exercises and light weight training. Newport Beach Country Club and former LPGA golfer Pam Higgins had just completed physical therapy for a related shoulder injury when she teamed up with Carrido. John Carrido runs Carrido Integrated Fitness, at 20321 Irvine Ave. Suite F2 Newport Beach Ca, 92660 . For more information call (949) 284-4205 or visit http://carridointegratedfitness.com.